Going to the far reaches of the globe is exciting and a lot of fun if you know where you really want to go and have made your mind up, but what if you have run out thoughts where you want to spend your vacation. A simple yet interesting vacation idea is to take your next holiday to the visit the great castles of England. While it seems like quite a boring way to spend a vacation but in fact it is very intriguing, and not only for the historians. While history plays a special part in the purpose of visiting the Castles of England, there are some very good reasons to take yourself and go all the way to England to around and look at English castles. The purpose most people take vacation is to rest their minds and bodies, to have fun and to take a leisurely pace away from the grind of everyday life. Visiting castles and other such historical sites provides all of these requirements and a whole lot more. Taking an English vacation to the Castles of England allows you relax while gently walking around the castle area, enjoy the elegance, and the naturally green views of the English countryside, get much wanted rest and fresh air from the exotic gardens and woods that usually take the back drop of English castles, and perhaps enjoy treating yourself in a round of golf at nearby golf clubs if this interests you. At night you would just be a few steps away from the old English pub where you could have a good traditional English dinner and perhaps a pint of English bitter or ale. One of the most unique English Castles, Leeds Castle rises serenely from the waters of its surrounding lake. The lake is an artificial one created by damming the River Len. The castle existed in 1139 because, in that year, King Stephen wrested it from Matilda’s supporters. The two islands on which suggest a motte and bailey origin, and the lake itself existed by 1272. In terms of stone work, however, the castle is essentially the work of King Edward I, with additions by Henry VIII and much nineteenth century beautification. Around the entrance, the lake decreases to a narrow moat. For the tourists, the addition of a golf course and other amenities makes it an ideal castle to see, not to mention the wonderful countryside typical of any visit to England makes the tour of this magnificent castle complete. One of England’s most important fortress , Dover castle has played critical roles in the history of England from the medieval times and even before that in ancient times all the way up to World War II, serving it’s country for a great number purposes and has been the castle that has watched England’s coastal borders with France ever since it was created. Dover Castle rises high above the town and harbor, crowning a hill, which ends at the White Cliffs. This site was first fortified in the Iron Age and the medieval castle fills the area defined by the ancient hill fort – thirty-five acres. The castle, therefore, is of extraordinary size and exceptional strength. No vacation to England would be complete without a tour to this old English fortress full of history and tales, a must to see when visiting the castles of England. Located in the center of London, this castle has been the center of England and home to many of its royalty since the Norman conquest of England, and has also played its role as the place where many of England’s famous villains have been executed. Standing alongside the River Thames, this castle has been the both a home fortress and a prison. A home to the Norman kings since William the Conqueror down to his successors and a prison to England’s enemies, both countrymen and foreigners alike, from from Ranulf Flambard, Bishop of Durham, who escaped in 1101, to Rudolf Hess, Hitler’s deputy, in the 20th century. 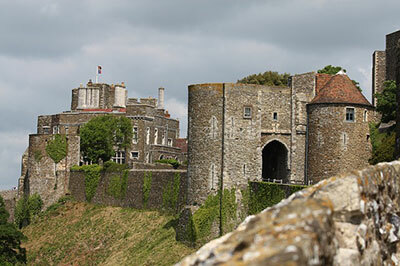 No castle in England other than perhaps Dover castle has been as critical to the English people. 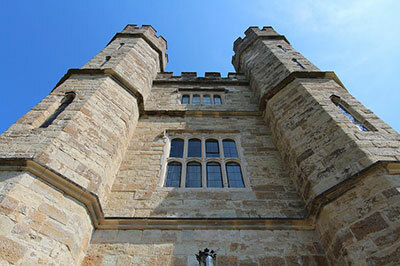 There are many other castles of England that you can see when taking your English Vacation to see English castles, and it would be best if you spent a little time and looked into what these castles have to offer in terms of history, features and generally whether a tour to any of them would be something that would really enjoy. The choices are many so there will not be any problems trying to find English castles that would be to your needs.